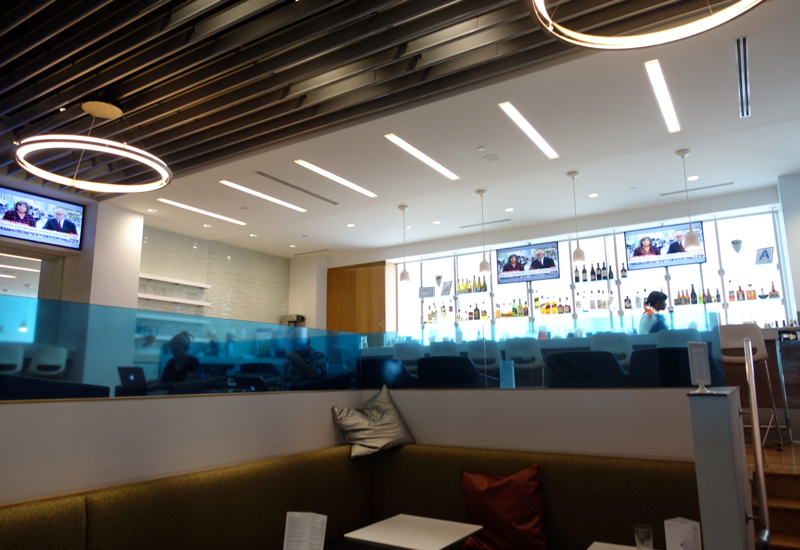 This Review of the Airspace Lounge at JFK Terminal 5 is one of our many posts on flights from JFK and New York. Visiting New York? See all of our posts tagged NYC. I rarely fly domestically or even to Mexico, but when I do and I'm not using miles for a business class award flight, I prefer to fly economy on JetBlue. 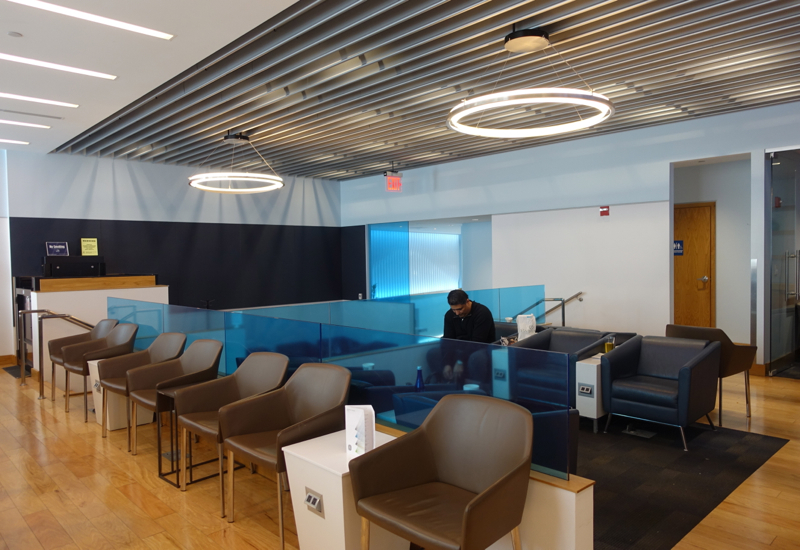 JetBlue doesn't have a lounge, however, so if you're flying out of Terminal 5, your best bet is to access the Airspace Lounge with your American Express Platinum card, if you have one. The Airspace Lounge at JFK's Terminal 5 is located near gate 25, after the Ben & Jerry's store. Access is complimentary if you have an AMEX Platinum card, either a personal or business version, or if you're flying Aer Lingus Business Class. If you have an AMEX Platinum, your immediate family members or up to two guests receive complimentary lounge access. Otherwise, you'll pay $35 + tax per person to enter. Lounge hours are 4:30am to 11pm daily. All guests do receive a $10 food and beverage credit to use during their visit. The Airspace Lounge is quite compact, but does have two levels of seating. The lower level has some comfortable booths with power outlets under each set of seats, while the upper level has bar seating and some armchairs. I was happy that there's a bathroom that includes a walk-in shower, which I took advantage of. 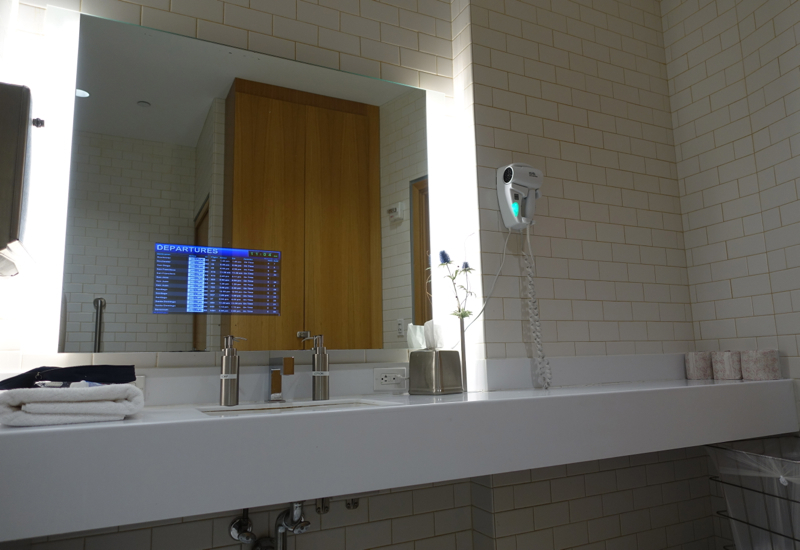 The mirror even has an embedded LCD TV with the departures, handy for keeping track of your flight. 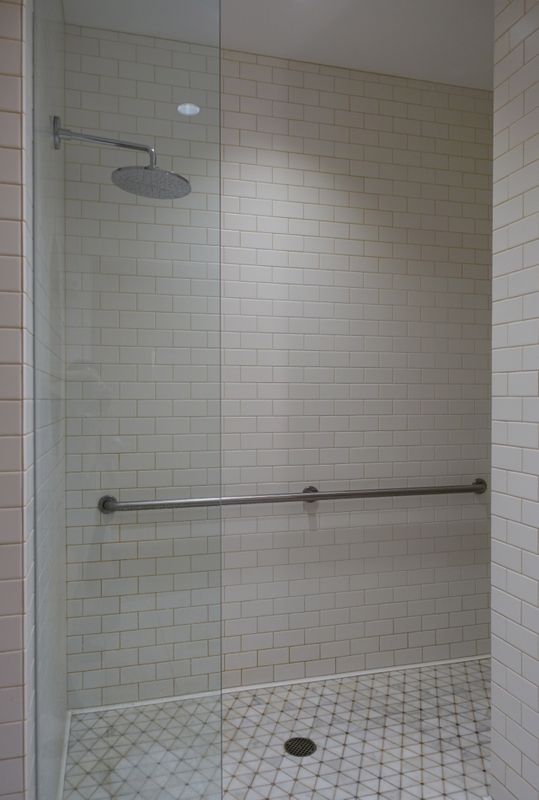 The shower is accessible for mobility impaired guests, and has a rain shower head on the left. It took awhile for the water to heat up, and the temperature gauge was tempermental, fluctuating quite a bit, and with rather poor water pressure. So not the best lounge shower, but at least the water drained properly and didn't flood the entire floor, as happened to me awhile back at the SWISS Arrivals Lounge in Zurich. 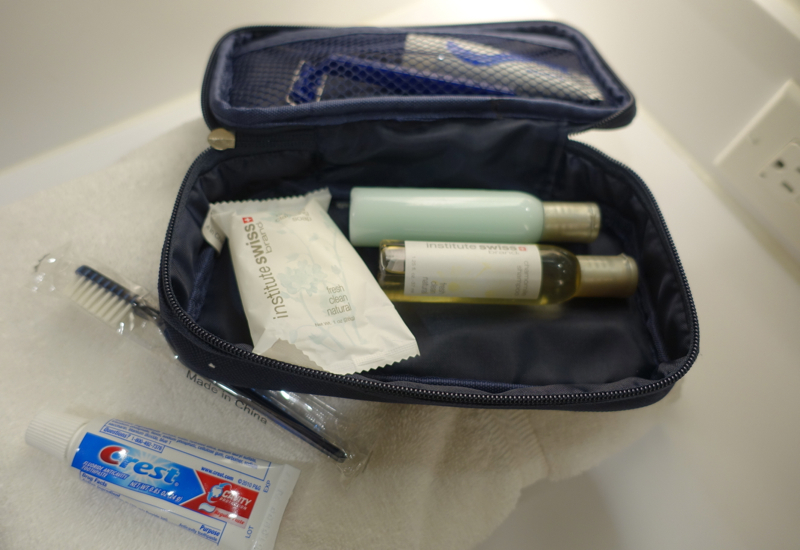 There was a simple amenity kit provided, which I appreciated, with all the basics: shampoo, conditioner, razor, toothbrush and toothpaste. A key omission, however, was a comb. 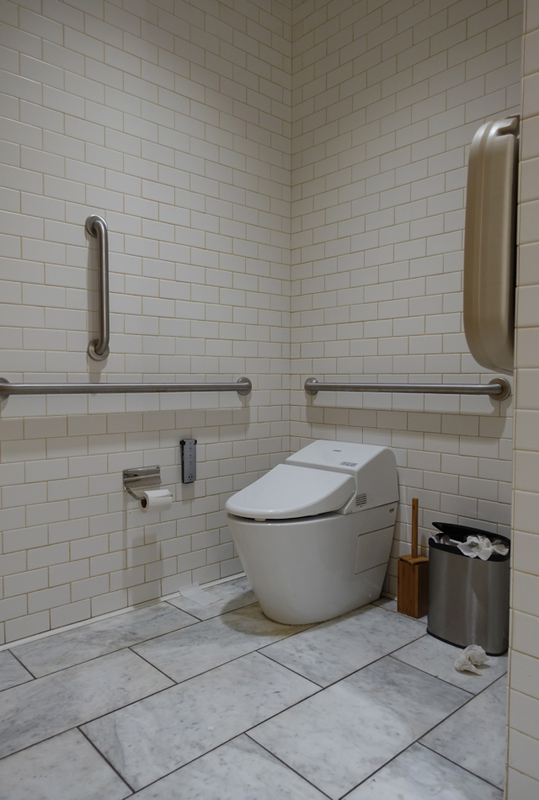 Probably the worst part of the bathroom is that, even though I was there mid-morning, around 10:30am, the bathroom wasn't properly clean, the fancy Toto toilet hadn't been flushed, and the small rubbish bin by the toilet was overflowing. 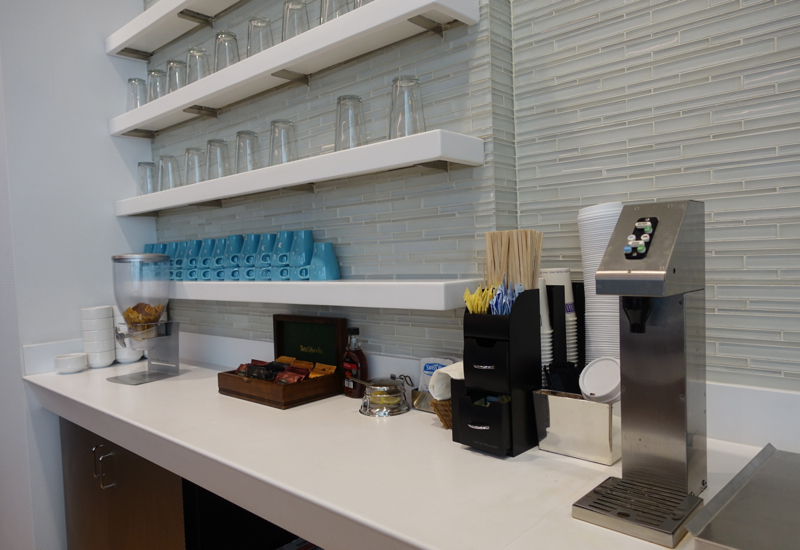 The Airpspace Lounge provides complimentary Peets coffee and tea, with Mighty Leaf iced tea also available. There was no milk available, however for the hot coffee or tea. 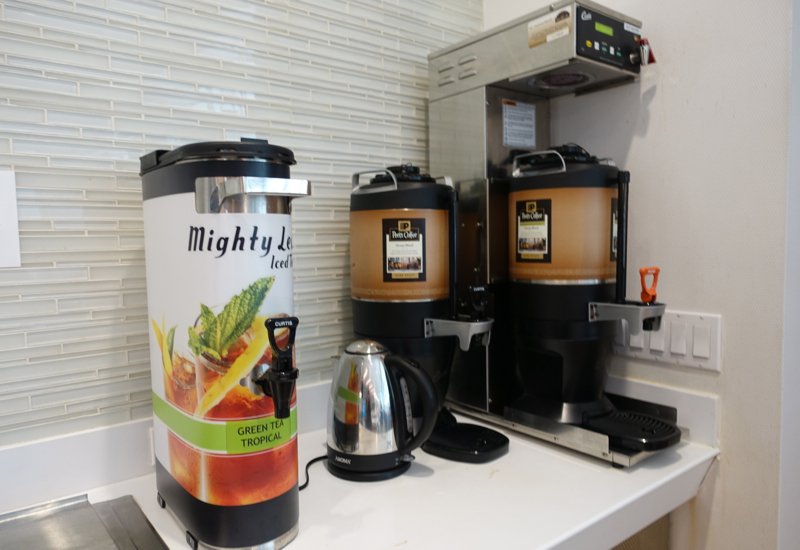 I was also sorry to only see Peets tea and no Mighty Leaf tea bags, which are available in the AMEX Centurion Lounges such as the AMEX Centurion Lounge at LaGuardia and AMEX Centurion Lounge in Las Vegas. The menu is very simple, with primarily cheese and antipasto plates, a breakfast sandwich and the like. 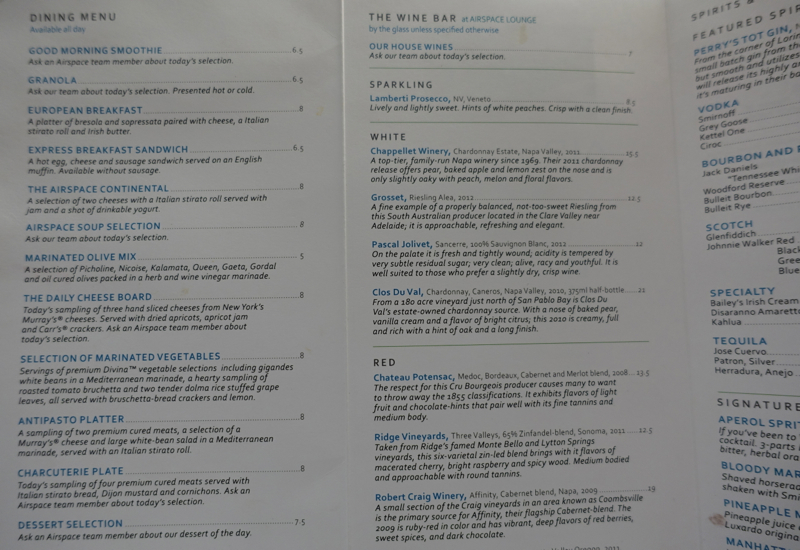 There are a variety of wines and spirits on offer as well, although nothing terribly compelling, especially at the prices charged. 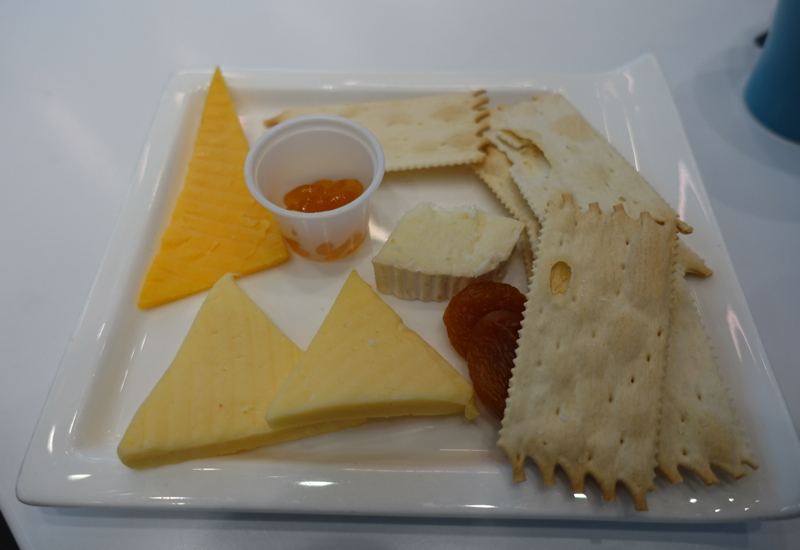 With my $10 credit, I decided to first try the Airspace Continental breakfast, described as two cheeses with an Italian roll, jam, and a shot of drinkable yogurt. I can't say I was too impressed by this, not least because the shot of drinkable yogurt wasn't yogurt at all, but some kind of juice, and most of the cheese was a simple cheddar. 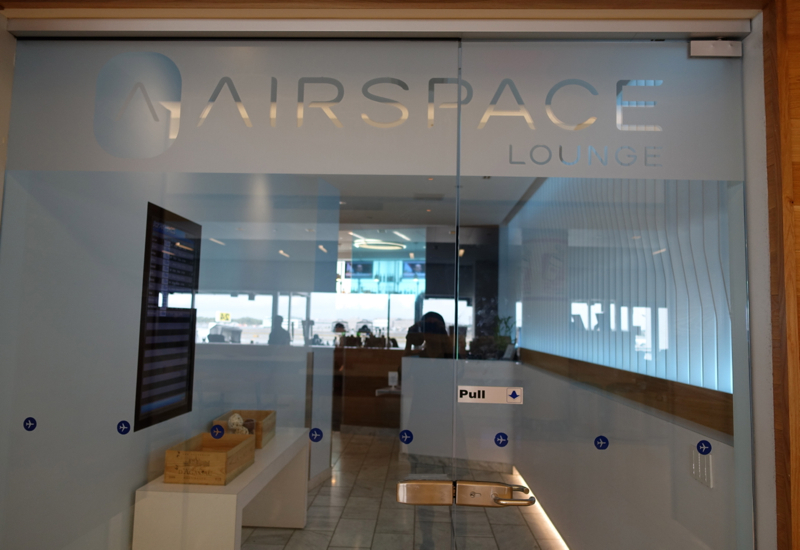 The Airspace Lounge at JFK Terminal 5 is the only lounge in Terminal 5, so it has no competition. On the plus side, it has a nice design aesthetic given the constraints of its small space, service was friendly, and it does have a shower room, which is more than most US airport lounges offer. WiFi worked well enough most of the time, but there were some issues using Skype caused by the sometimes slow connection. The food menu read better than it delivered–don't expect anything gourmet here even with the cheeses supposedly sourced from Murray's Cheese Bar–but it staved off hunger. The worst aspect of the lounge was the rather dirty bathroom; even though a lounge attendant got a towel and amenity kit ready for me, the bathroom clearly hadn't been cleaned from the prior guest. 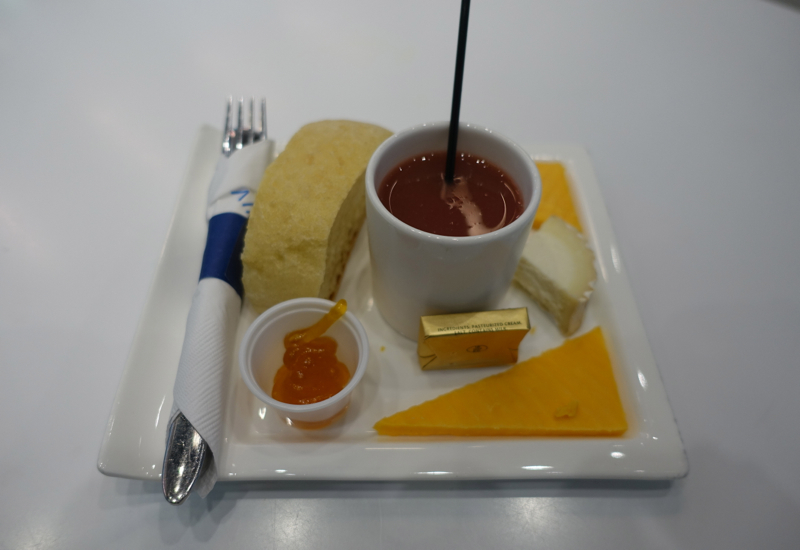 If you've visited the Airspace Lounge at JFK Terminal 5, what was your experience?